Surface-Hydrophilic Elastomers (I. Noda). Emulsion Polymerization with Oligomeric Diblock Macromonomer Stabilizers (L.A. Schechtman). Investigations of the Polymer Interphase via the Synthesis of Well-Defined Selectively Deuterated Block Copolymers (S.D. Smith et al.). Synthesis and Morphology Studies of (AB)n Multiblock Copolymers (R.J. Spontak et al.). Study of Blends with Narrow Molecular Weight Distribution: Hydrogen and Deuterium Labeled Polystyrene and Poly(vinyl) methyl ether) (M.M. Satkowski et al.). The Nature of the Crystal/Amorphous Interface in Polyethylene and its Blends (R.S. Stein, M.M. Satkowski, I. Noda). Hydrogen Bonding Interaction in Polymer Blends (E.M. Pearce, T.K. Kwei). Quick Quenching of Polymer Blends (S.N. Boen et al.). Dynamic Light Scattering of Ternary Polymer Solutions (D.N. Pinder, P.J. Daivis). Local Dynamics of Polymer Chains in Restrictive Environment (B. Erman, I. Bahar). Novel Orientation Techniques for the Preparation of High-Performance Materials from Semi-Flexible Polymers Such as Cellulosics (B. Erman et al.). Isotropic-Nematic Phase Transitions in Polymer Networks Deformed in the Dry and Swollen States (A. Kloczkowski et al.). Polymerization and Thermal Quench Induced Phase Separation in Polymer Dispersed Nematic Liquid Crystals (T. Kyu, M. Mustafa, J.-C. Yang). Characterization of Lyotropic Polysaccharide Liquid Crystal Blends (R.J. Spontak et al.). Effect of High Temperature Annealing on the Capillarity of Polyamide Microporous Membranes (R.A. Knight, T. Hazlett, C.C. Gryte). A Technique for Accurate Characterization of Adhesion between Incompatible Polymers (Y.Z. Chu, C.J. Durning). The Influence of the Fiber/Matrix Interface on Local Glass Transition Temperature (N.R. Sottos). Species Transport and Distribution in Thin Polymer Films Using Eigenmode Analysis in Integrated Optical Structures (P.W. Bohn, N.F. Fell, Jr.). Composite Conductive Polymers Characterized by the EQCM Technique. Incorporation of Redox Compounds into Polypyrrole Films (M. Hepel, L. Dentrone, E. Seymour). Determination of Polycarboxylates in Water Samples by Means of Polyelectrolyte Titration (U. Shroeder, D. Horn). Size of Tetradecyltrimethylammonium Bromide Aggregates on Polyacrylic Acid in Solution by Dynamic Fluorescence (J.J. Kiefer, P. Somasundaran, K.P. Ananthapadmanabhan). Catalysis of Hydrolysis by Proteases at the Protein-Solution Interface (D.N. Rubingh, M. D. Bauer). Lateral Diffusion of Lipase at the Air/Water Interface (S. Kim, H. Yu). Author Index. Subject Index. 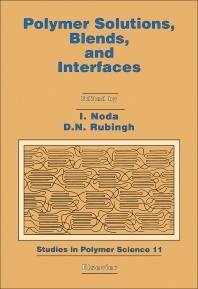 The behaviour of polymers in multi-component and multiphase systems such as solutions, blends and interfaces derived from both natural and synthetic sources and the subsequent influence of this on their physical properties is the theme of this book. Important new material on multiphase polymer systems such as block copolymers and liquid crystalline polymers is provided, and the solution and surface properties of enzymes and surface active polymers is described both theoretically and experimentally. The application of theory to the development of new cellulosic materials is particularly noteworthy. The relationship between end-use properties, such as adhesion, wetting, and colloidal stability, and molecular structure at the interface is addressed. Examples include the capillary pressure of nylon microporous membranes, a new technique for characterizing the adhesion between incompatible polymers, and the influence of the glass transition temperature at the fiber/matrix interface on interfacial shear strength. Characterization of polymer films, both electrochemically and via optical techniques is covered and the interactions of amphiphilic ions with polyacrylate polymer are described. The final two chapters introduce the topic of enzyme mobility at an interface and show how this may affect their role as biological catalysts.